McGregor looks almost certain to be ruled out of action following a bizarre outburst in Dublin’s 3 Arena on Friday night. 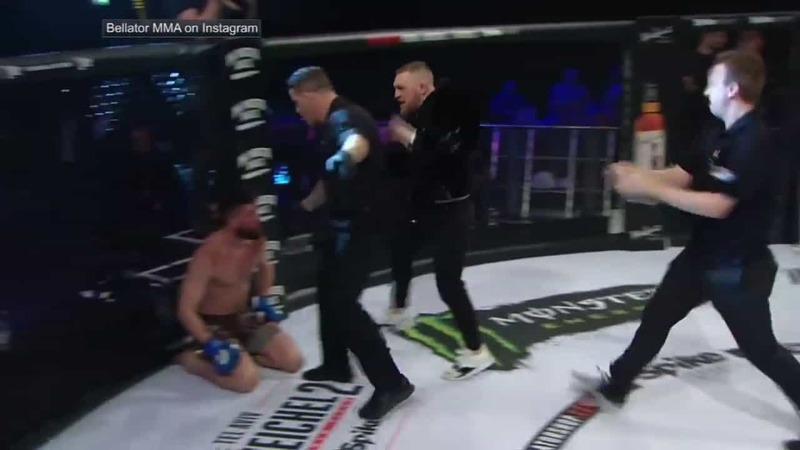 McGregor jumped the cage and darted towards his SBG Ireland teammate Charlie Ward following the latter’s victory over John Redmond in the first round at Bellator 187 in Dublin on Friday night. McGregor, who was not officially in Ward’s corner, could not hold his excitement as he ran and slipped while attempting to embrace Ward. The Referee on the night, Marc Goddard, assertively demanded McGregor to leave the cage. Goddard has history with the Irishman and it was clear to see McGregor did not appreciate his intervention or the referee placing his hand on his chest. The 29-year-old superstar shouted back at Goddard before shoving him as he approached the beaten Redmond. McGregor was then ushered away before leaving the cage of his own accord. Goddard recently ordered McGregor to leave cageside as he supported Artem Lobov at UFC Gdansk last month. The furor is bound to attract some negative criticism, given McGregor’s position in the UFC and his role-model status in his native country. “The Notorious” is a polarizing figure in Ireland due to his brash attitude and what many believe is his ambassadorial status within the sport of MMA – a sport which many in the country are still yet to warm to. As the Ward bout was in conjunction with a Bellator fight card, there will be questions asked by the UFC top brass around why their biggest star was giving free publicity to their biggest rival. It was this kind of carelessness that will inevitably bring the Dubliner back to earth. Although McGregor looked happy to leave the cage, he then changed his mind and rushed back towards the cage shouting “that was a f*cking stoppage” prior to being requested to leave again. In true McGregor fashion, however, he then ran around the cage and waved to fans inside the arena in the heart of Dublin’s docklands. There are many videos of the incident already circulating showing the MMA megastar in what will surely be looked at as one of his more disappointing moments. A video posted by TMZ certainly backs this up as it clearly shows McGregor slapping a Bellator official prior to attempting another entrance into the cage. With plans for a UFC 219 headline bout against Tony Ferguson up in smoke, it may be a while before we see McGregor fight again. It is not as though a bout with Ferguson was something which McGregor expressed great interest in. Although the 29-year-old admitted that contract negotiations were currently ongoing, this incident will surely result in the Irishman being slapped with some form of punishment which may get in the way of a 155-pound title unification bout. “We’re in negotiation stage right now. That’s a lengthy process,” McGregor told the BBC (via MMA Weekly). “They’ve got to make me excited about it. I came from a crazy event, a record-breaking event, the billion dollar fight it was labeled. I made insane money. Then the opponents they’re trying to line up for me, an opponent [Tony Ferguson] with a $600,000 gate in Las Vegas. Following a crazy night in Dublin, this fight looks unlikely to go ahead at all.